↑ Ford & Zaloga 2009, p. 342. ↑ 2.0 2.1 2.2 Ford & Zaloga 2009, p. 25. ↑ 3.0 3.1 Beevor 2009, p. 76. ↑ 4.0 4.1 Williams 1988, p. x. ↑ Beevor 2009, p. 492. ↑ 6.0 6.1 6.2 Beevor 2009, p. 82. ↑ Ford & Zaloga 2009, p. 7. ↑ Ford & Zaloga 2009, pp. 60, 63, 118–120. Ellis, L.F.; Allen, G.R.G. ; Warhurst, A.E. (2004) . Butler, J.R.M, ed. Victory in the West, Volume I: The Battle of Normandy. History of the Second World War United Kingdom Military Series. London: Naval & Military Press. ISBN 1-84574-058-0. 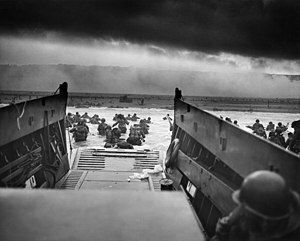 "D-Day and the Battle of Normandy: Your Questions Answered". Portsmouth Museum Services. สืบค้นเมื่อ 18 April 2014. US Department of the Navy, Naval History and Heritage Command. "D-Day, the Normandy Invasion, 6 – 25 June 1944". Frequently asked questions. สืบค้นเมื่อ 29 April 2014. หน้านี้แก้ไขล่าสุดเมื่อวันที่ 11 สิงหาคม 2561 เวลา 10:35 น.